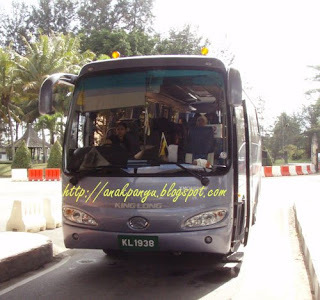 i've successfully organized a bus trip to Miri yesterday. Family and Friends. The bus with 33 passengers was fully occupied. I've managed to sell all the seats and ada ulih untung sikit sikit. We departed around 7:05am from my mother's house and we reached Miri around 10:15am. There was no problem at the border. Borang putih Malaysia are no longer in use, so sanang lah sikit. mencap passport, they only need one person to bring all the passport, inda payah semua turun. Imperial Mall - 2 1/2 hours, Bintang Plaza - 2 1/2 hours, Boulevard - 1 1/2 hours and e-mart - 1 hour. 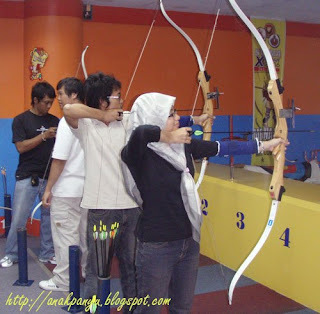 At Bintang Plaza, some of us main Archery. It's pretty much the same as in KB. The only different, it is much cheaper here. 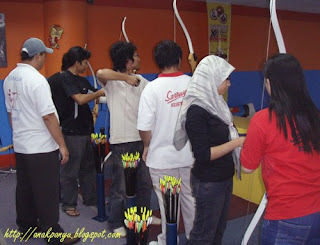 I only need to pay RM48 for five people - 5 bows and 150 arrows. We reached home around 8:30pm. Sayangnya, inda banyak gambar. maybe you can check here mana tau ada gambar kana upload.